I keep getting requests to post recipes or videos of how to make makki ki roti or any millet roti perfectly. Taking step wise pictures or making a video is not possible for now but I thought of letting you all know a nice shortcut way to make makki ki roti nice and round without much hassle. This roti is softer and rolls out better on the chakla belan. It wont be a fright anymore to make makki ki roti if you apply this method. I can make a normal makki ki roti with ease, just taking care to knead the dough using hot water. I can easily pat the roti in my hands, I have large hands by the way, and flip it on the hot griddle. But it comes with practice. You might find it tough if you are new to rotis or have never handled any millet flour. The roti in the picture is hand patted and made the old fashioned way as I did not want to dilute the makki ka atta taste, our neighborhood chakki wala had made really fresh makki ka atta this time. The trick I do when I am in a hurry and want the rotis to be rolled out on the chakla nicely, I cook some oatmeal with water and knead the makki ka atta with that. No more cracked edges, thinner roti and easier handling on the griddle too. The rotis stay softer even when cold. The ratio for the dough is, 2 heaped tbsp of oatmeal to be cooked in half cup of water, salt can be added but I normally avoid it. Now add a cup of makki ka atta and knead well, you might need to add a little more makki ka atta if you can't handle soft dough on the chakla belan. The same method works for jowar or bajra rotis as well. Try that if you find cooking millet rotis difficult. 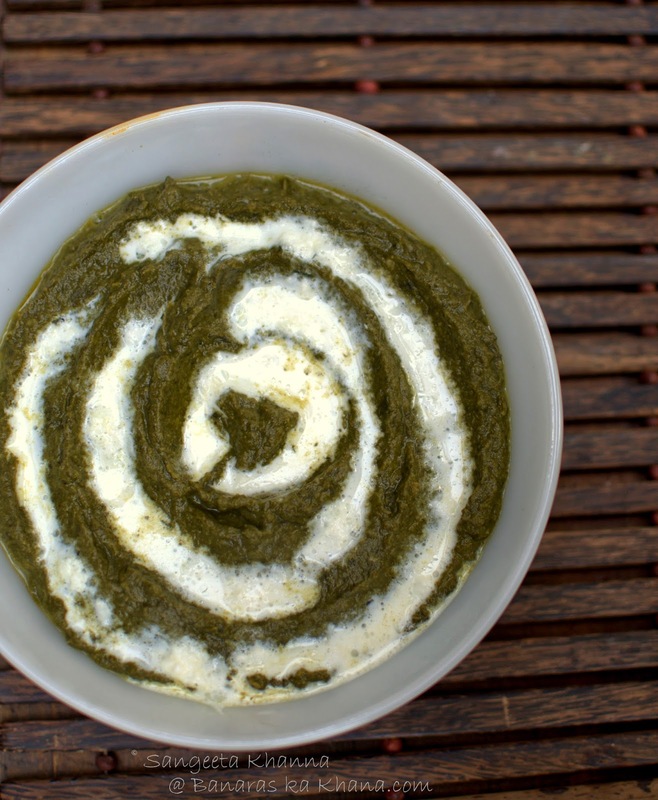 Now the recipe of this new version of sarson ka saag. I make this spicy version of sarson ka saag every winter but last year I saw a recipe by a friend Promilaa that looked really interesting and very different from what I cook. It was without any garam masala or tomatoes or even onions that I used to add diligently. I could not cook it last year and this season too it got really late. But better late than never. In the last leg of winters when the mustard greens are on their way out, I bought a huge bunch and got set to make some sarson ka saag. I actually made two versions and loved them both. Here is the first version which is based on Promilaa's recipe. Peel the stems of mustard greens if it is too hard. Clean and chop all the leaves and stems. Clean and chop the spinach as well. Promilaa's recipe uses only spinach stems but I could not discard the leaves as these were from my own garden. Boil both the saags in a kadhai covered with a fitting lid, with added salt to taste. No water is required if you have washed the greens just before cooking. It takes about 20 minutes to get cooked. Cool down and blend in mixie or use the hand blender to blend it in the kadhai itself. Now add the makki ka atta and mix well. Cook till the saag puree starts puffing up in violent bubbles. Keep it covered if you are standing next to it. Make a tadka by heating the ghee in a smaller pan, add the chopped green chilly, chopped ginger and deghi mirch and pour over the cooked saag. 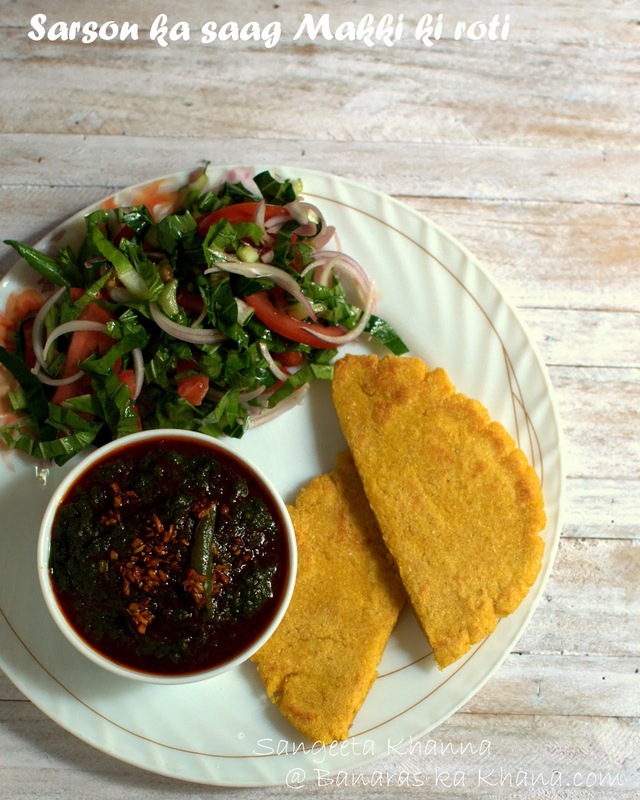 Serve immediately with makki ki roti. 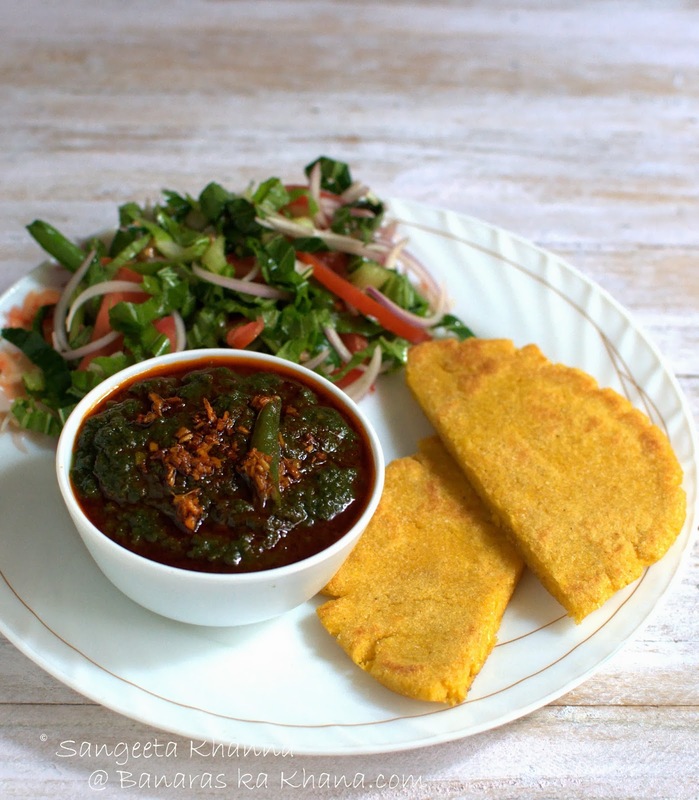 This is a refreshingly simple and clean flavoured recipe of sarson ka saag. I would have liked some garlic in it as I feel garlic makes all greens more palatable and prevents flatulence as well. I also missed the white butter I love in my sarson ka saag. But to tell the truth, the saag is really tasty in a different way. Arvind liked it more than me. I cooked one more version of sarson ka saag, using some bathua and methi leaves as well but the spices were not added in this one too. The recipe is here..
Heat ghee in a kadhai and add the chopped garlic, ginger and green chillies in that order and fry them till a bit pinkish brown. Add the chopped greens, salt to taste and cook till done, covered. No water is required if you cook the saag on low heat. Liquidise when done. Serve hot with fresh cream or white butter. I think I will be making this recipe more often as this is the one simpler recipe that I liked so much I finished it almost all by myself. That too without any roti with it. I might cook some more saag till there is some more mustard greens in the market. Try these and let me know if these recipes worked for you. Note that both these recipes are very different form each other in taste the first one has a nice kick of chilly and ginger heat while the second one is a mellow creaminess. Both recipes are like day and night and yet superbly and equally tasty. looks soooo delicious n tempting..lovely clicks too!